The hottest show on Broadway for the past two years, the musical was certainly a spectacle. When something that popular and well-reviewed comes to town, it is a must−see even for somebody who is not that keen on musicals. 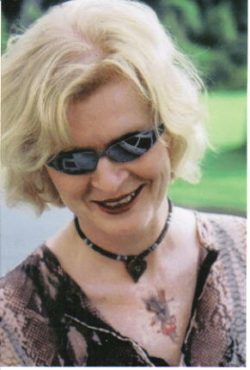 Therefore, this month I’m not writing a book or movie review ─in spite of the upcoming Oscars. 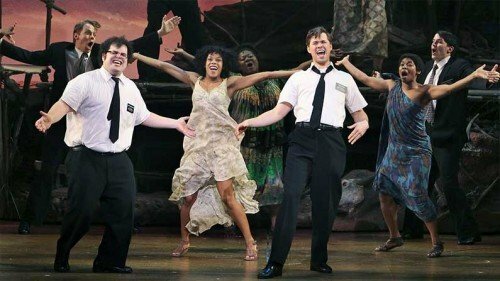 Knowing that the producers of this musical are the makers of the animated comedy South Park, it won’t come as a surprise that The Book of Mormon is a religious satire musical. 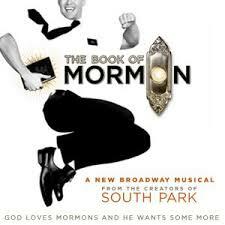 Warning: the musical is not for the fainthearted or those who see it as blasphemy to make fun of religion. However, it is an equal opportunity offender as it playfully pokes fun at worship, sexuality, poverty and race. The show plays fast and loose with explicit language. The Book of Mormon tells the story of two young Mormon missionaries sent to a remote village in northern Uganda, where a brutal warlord is threatening the local population. Naïve and optimistic, the two missionaries try to share the Book of Mormon, one of their scriptures—which only one of them has read—but have trouble connecting with the locals, who are more worried about war, famine, poverty, and AIDS than about religion. The musical is loud, the singing sometimes hard to understand, especially when spectators around you are almost rolling in the aisles laughing or practically dancing in their seats. In spite of its blatant irreverence and disrespect of the religious book, the spectator walks away on a positive note. The musical conveyed the idea that these young missionaries are dedicated and kind people who also spread the message of being kind to one another. Although the Ugandans made up their version of the Mormon religion by skewering and changing the message, it had a positive effect on them and improved their lives. I was surprised that the Church doesn’t boycott performances but, on the contrary, does see it as an opportunity to cultivate relationships with everyone. Compliments to the Church that they have such grace and tolerance – especially in the light of Charlie Hebdo. The Book of Mormon earned overwhelmingly positive critical response and set records in ticket sales. It was awarded nine Tony Awards,, one of which was for Best Musical, and a Grammy Award for Best Musical Theater Album. The original Broadway cast recording became the highest-charting Broadway cast album in over four decades, reaching number three on the Billboard charts. It has staged two national tours since it premiered in the West End in 2013. 2 Responses to "The Book of Mormon"
Very interesting! I have two friends who are Mormon. I always enjoy other perspectives! Good and interesting work, Hernibs. Thank you.